Korea pack 2013, starting on 28th May 2013, is the most representative show in Korea focused on all kinds of packaging processing equipment based on a field of food, pharmaceutical, cosmetic, and electronics industry in Korea. Since it has been launched in 1992, the 18th KOREA PACK 2013 is exhibiting their new products from more than 800 companies in the world at the 50,000m² exhibition hall, KINTEX for more than 40.000 visitors. 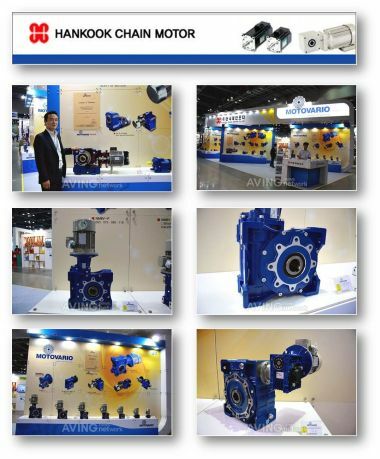 Even in 2013, Korea Pack is confirmed as the most interesting fair for all companies dealing with the Far Eastern markets. The brand will be represented by Motovario Hankook Chain Co. Ltd, since 2005 important partner and distributor of Motovario for the Korean market. Hankook will be exhibiting on the stand all Motovario products, in particular the new worm gear boxes suitable for hygienic and/or corrosive ambient: the new range NMRX, SWX and SWFX.